Eligibility: 10+2 with Physics, Mathematics and Chemistry (Min. 50% in each subject) from recognized board or University. The AME Course is a three year course where students have to undergo six semesters. The first five Semesters will be conducted in classrooms coupled with practical Training in our Workshops/Labs/Aircrafts. In the sixth semester, the students will undergo On Job Training (OJT) within the premises/Commercial Airline industries. This course is recognized by DIRECTOR GENERAL OF CIVIL AVIATION, MINISTRY OF CIVIL AVIATION GOVT OF INDIA. Aircraft certification is required to be carried out by a person who has been specifically trained to inspect and evaluate the safety and airworthiness aspect of the aircraft and its system. Thus, an AME is expected to be a dedicated, knowledgeable and skilled professional. Having been required to perform such responsible tasks, the Government of India in concurrence with the International Civil Aviation Organization (ICAO) has entrusted the Director General of Civil Aviation (D.G.C.A.) under Ministry of Civil Aviation to issue ‘LICENCES’ to these Aircraft Maintenance Engineers (AME’s). Only a Licensed AME is authorized to certify the airworthiness of an aircraft. 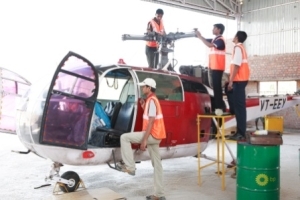 In order to obtain a License, a potential AME is expected to undergo an approved AIRCRAFT MAINTENANCE ENGINEERING COURSE after completing his 10+2 and fulfilling specific laid down requirements prescribed by the DGCA. While undergoing the approved curriculum he/she is subjected to a set of examinations, which are conducted by the DGCA upon the qualification of the same he/she is issued with a LICENSE. Thereafter a student is exposed to the real life aviation maintenance environment, with an airline or an Aircraft Maintenance Organization. This is only the Engineering Industry where wide scope to acquire intra-branch knowledge is available. Student who is scoring about 80% in DGCA license examination will be given 10% concession on semester fee. The top three rank holders in DGCA license examination will be sent for ON JOB Training in any of the leading Airline on the institute expenditure. At the end of each semester, examination will be conducted by the College. On completion of five semesters the student shall undergo the mandatory six month On Job Training at the AME institute. Course completion certificate is issued upon completion of three years AME course. Students of AME course can also appear and qualify as AMAeSI (Associate Membership of Aeronautical Society of India) which is fully recognised by Government of India / State Government / Union Public Service Commission (U.P.S.C.) / G.A.T.E. for M.Tech admission / Hindustan Aeronautics Ltd., / Indian Airlines / Air India / B.H.E.L. / D.R.D.O. / N.A.L. / I.A.F. / Coast Guard / Airline Industries etc. / CMC & NEHRU Institute of Technology, Covai/ Madras Institute of Technology and many other Government, Public and Private sector as equivalent to B.E / B.Tech (Aeronautical Engineering).